I wish you an enjoyable break, dear friend. The dressing gown is so lovely on you. I look forward to your return. God bless you. Beautiful gown. Love those colors! I understand the need to take blog breaks. I take them often myself. Enjoy your time away! 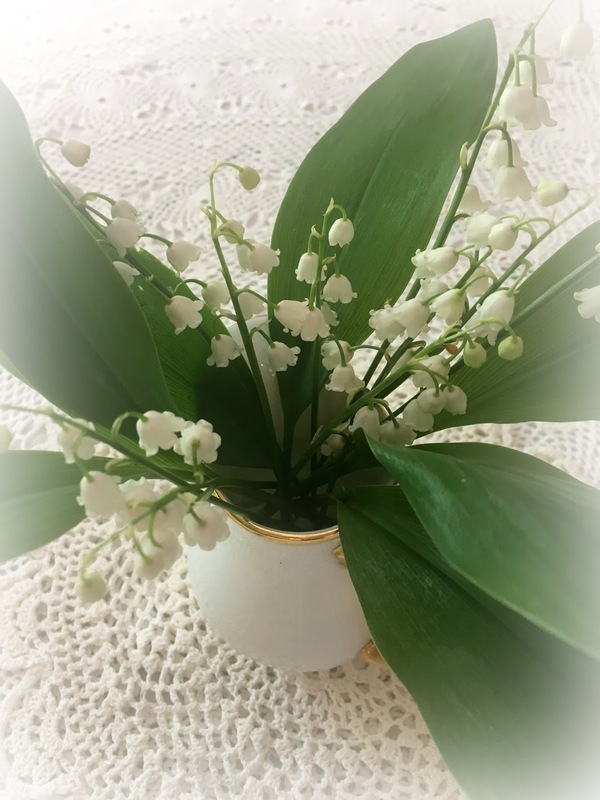 Oh, lily of the valley is a delight to me. They were my maternal grandmother's favorite flowers, also my mother-in-law's. such a lovely fragrance. Enjoy your break dear Deborah. Love lily-of-the-valley and your dressing gown is so pretty. Robin egg blue is one of my favourite colours. It looks lovely on you! The gown is very pretty! Have a good rest! That robe is darling! Looks so cute on you. Have a blessed continuation of a break. See you in June! 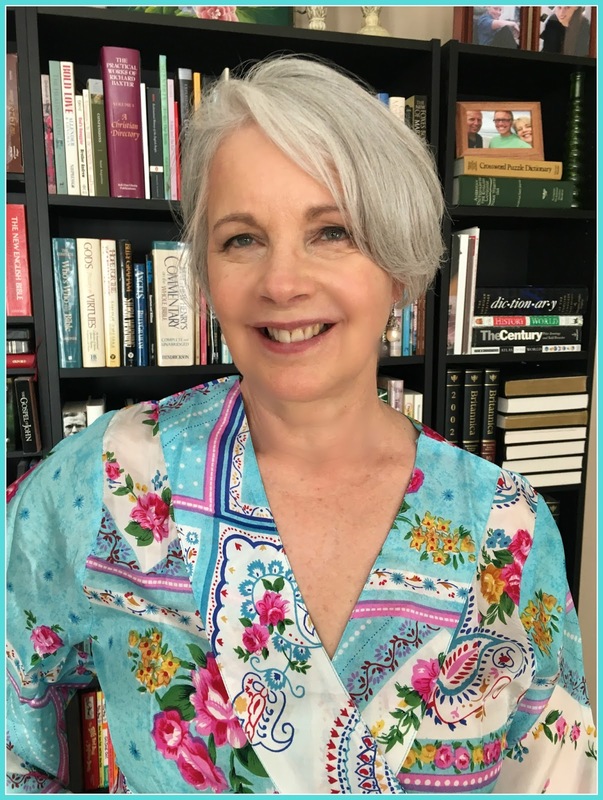 You look lovely in your new robe Deborah. Enjoy your blog break, sometimes they're needed to inspire future posts. Bless your heart dear Deborah. May you have a refreshing break. Your silk dressing gown was just made for you and you look very lovely in it. Enjoy your time, Deborah. I hope whatever is planned is something lovely and not something worrisome. LOVE that dressing gown on you! Love your silk dressing gown; a warm gift! Also your Lily of the Valley no doubt emit lovely perfume; wish they would thrive here. Hello Deborah, I love that pretty gown on you and how thoughtful. I hope you enjoy your blogging break. Oh friend, the dressing gown is lovely! I understand your need for a break and I hope you have a lovely time away. You will be missed, but enjoy some time for YOU! What a lovely photo of you Deborah...your daughter knows what to pick out for you! Enjoy your break and will be looking forward to seeing you soon! Love the pretty and bright pattern of your dressing gown. Enjoy your blogging break! I understand the need for a blogging break, spring is such a busy time! Those gorgeous flowers, oh my, yes how thankful I would be that someone planted them too! Beautiful picture of you in your new dressing gown, it is gorgeous! Enjoy your time off, thanks for letting us know that you are just taking a break. Hugs! I am just coming off a long break just as you are going on one! Enjoy your time....we've been so busy that I just did not have time to spend on blogging. Looking forward to your return, hope all is well....your gown is lovely! Hugs!